The final test of the India tour of Australia series started today and as Smith elected to bat, the top four Australian batsmen kept the New Year Party on playing in the test linked emotionally with Phil. 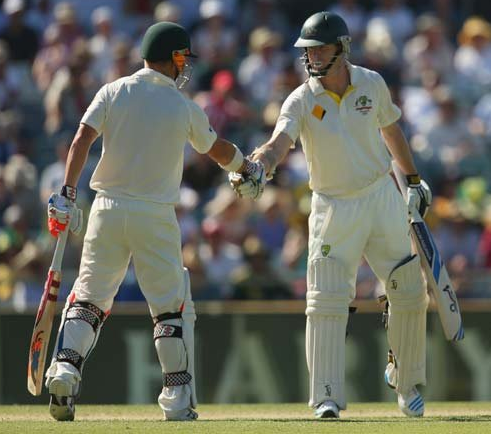 The openers added 200 runs and then Watson and Smith have added unbeaten 148 runs. Indians kept dropping catches and unimpressive bowlers could grab only 2 wickets as Aussies finished 90 overs of Day 1 with 348/2. 289 by Vijay and Dhawan (2013, Mohali), 217 by DC Boon, GR Marsh (1986, Sydney), 214 by Cowan, Warner (2012, Perth) are other partnerships above 200 runs for 1st wicket. 30th 100+ partnership for 1st wicket in Ind-Aus series. 28th partnership of 200 or more in Ind-Aus series. 10 of them belong to India. 41st partnership of 100+ for 3rd wicket in Ind-Aus series. 9 of them scored above 144 runs that Watson and Smith have added so far. Indians made 4 changes to the team including the change in help. Captain Kohli had no option but to bring in Wriddhiman Saha to replace wicketkeeper Dhoni. He also decided to bring in Suresh Raina and Rohit Sharma to replace out-of-form Shikhar Dhawan and struggling Pujara. As B Kumar was fit to play, Ishant Sharma had to make way for him. But overall, Kohli too went with just 4 specialised bowlers and instead tried to strengthen batting. Aussies had to include Starc to replace injured Johnson. Chris Rogers was getting ready with consistent 50s for a big knock. Warner was silent after twin centuries in first test. Warner decided to start new year with a dashing century, his 12th, while Rogers, who had scored a century in the last test he played at Sydney unfortunately fell short by just 5 runs. In the meanwhile the opening pair added 200 runs. India struck with two quick blows as Ashwin sent Warner and in next over Shami bowled Rogers. But, there was no relief. Out of form Watson also finally retained his form hitting a fluent half-century and the on-song Captain Smith continued his march towards the 4th century of the series. By the end of the first day’s play both had added 144 runs for 3rd wicket. Smith was unbeaten on 82 runs while Watson returned unbeaten on 61 runs. Indians had a bad day on field. There were catches dropped, misfieldings and in the end bowling figures were nothing to be proud of. B Kumar (0/67 in 20 overs), Umesh Yadav (0/97 in 16 overs), Shami (1/58 in 16 overs) and Ashwin (1/88 in 28 overs) failed together. Raina (0/35 in 10 overs) tried to give them rest. But the run flow did not decrease as Aussies batted freely throughout the day. Unless a miracle happens tomorrow morning, Aussies are well on course towards their 4th consecutive 500+ total.